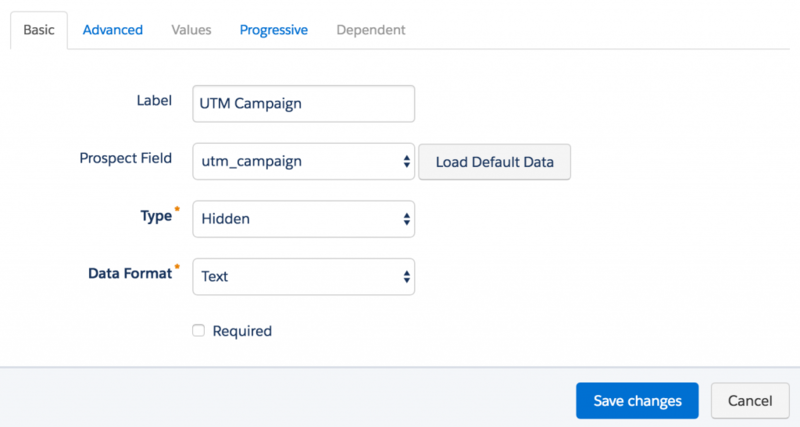 In part 1, I covered how to use UTM parameters to capture lead source when you are embedding a Pardot form on a Pardot landing page. In this post, I will cover how to implement the same method using an iFramed form on a web page. Note: step 1 and step 2 are the same as the instructions outlined in part 1. The first thing you need to do is create 2 new fields in Salesforce and in Pardot and map them. You don’t need to create a field for utm_source, we will use the standard source field in Pardot. Next, add the fields to your Pardot form. All 3 fields should be hidden and not marked as required. This piece of code will parse the URL parameters and put the values into the hidden fields within your form. This code can be placed within your landing page template or within your form in the below form section. Use the standard iFrame code Pardot provides to embed your form on your webpage. Now you’re ready to start creating URLs and testing your form. Use this handy URL builder to create your links and then fill out the form to see if the values go into Pardot. Hey Jenna! Pleasure to connect with you directly! I'm on the Pardot Specialist team over at Salesforce and UTMs are one of my favorite topics. I love sharing these articles with clients. Very well written and user-friendly. Quick thing I noticed that I figured you'd appreciate seeing - it looks like you use the same "add some code to your landing page templates" verbiage in this article that you use in part one here (https://jennamolby.com/how-to-use-utm-parameters-to-capture-lead-source-in-pardot/) even though this article seems to be focused more on iframed forms on the site as opposed to Pardot landing pages. Let me know if I'm missing something! But figured I'd pass along as a friendly observation - confused me at first glance since it isn't speaking to how the code would be embedded on the website page in this case. Anyway, thanks for all your amazing content - you probably know this, but our team shares your articles with our clients constantly :) So thanks for all that you do!